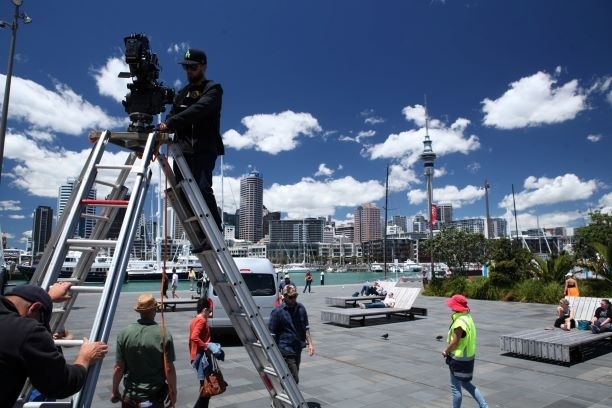 The screen production industry contributes more than a billion dollars a year to their region’s economy, and now a comprehensive survey of Aucklanders has shown they are keen to see more filming in Auckland. More than 4700 Aucklanders responded to questions about filming included in Auckland Council’s public People’s Panel survey in September – covering topics such as the impact of filming in public places, how people encounter public filming, and perceived benefits of screen production. Screen Auckland is a division of Auckland Tourism, Events and Economic Development (ATEED). Its key roles are to facilitate Council film permits for public open spaces across the region, and to attract domestic and international productions to the city with industry and the New Zealand Film Commission. In recent years, more than 600 permits have been issued annually for filming in a wide range of parks, beaches, streets and other public areas by productions from large budget feature films, to television series and commercials as well as emerging film makers working on short films and student productions. When asked about professional filming in general, 70 per cent of the People’s Panel respondents said they would like to see more filming in Auckland; 84 per cent agreed filming 'creates job opportunities'; and 80 per cent said it 'is good for tourism'. Only 2 per cent of respondents wanted less filming, and 12 per cent described it as a ‘nuisance/inconvenience’. Michael Brook, Manager Creative Industries at ATEED, says the survey findings were extremely pleasing in a city which has a high level of public filming, and whose film friendly aspirations are captured in the Auckland Film Protocol. “The screen production industry is economically important to the Auckland region, employing more than 3500 people and supporting more than 1600 businesses. So it is vital that the industry is supported and productions welcomed. “But it’s also important that we understand how Aucklanders perceive filming – particularly as it is an industry that relies on public space and can have impacts on businesses and residents – and we use the information to help find a balance between the needs of production companies and our communities,” says Michael Brook. More than 60 per cent of respondents had encountered public filming (most commonly in a residential street, or the central city), and 12 per cent were involved as cast, crew, production or supplier. “It was good to see that most Aucklanders would like to see more filming in their region, and more than 80 per cent of respondents said the filming they encountered had either a positive impact, or no impact, on them,” says Michael Brook. The respondents were asked to provide feedback on any impacts, and they were mostly about filming limiting their access to public areas, blocked parking, and road closures. “Our permitting team always focuses on working with Auckland Council and production companies to reduce inconvenience where possible – while balancing the objective of being a city open for filming, given the huge creative economic value it creates for Auckland,” says Michael Brook. He says the survey’s comments section encouraged respondents to provide feedback about how potential impacts could be reduced.